The vulnerable Republican Congressman shocked local observers with an announcement that he would retire after his term ends. The already high-profile race with four major Democrats now will include a scrum on the right. Congressman Darrell Issa’s sudden announcement Wednesday that he was retiring caused San Diego County Republicans to scramble and offer an onslaught of speculation about which Republican would try to save the seat. Four high-profile Democrats remain in the race, and now the 49th Congressional District could become a free for all on the right as well. 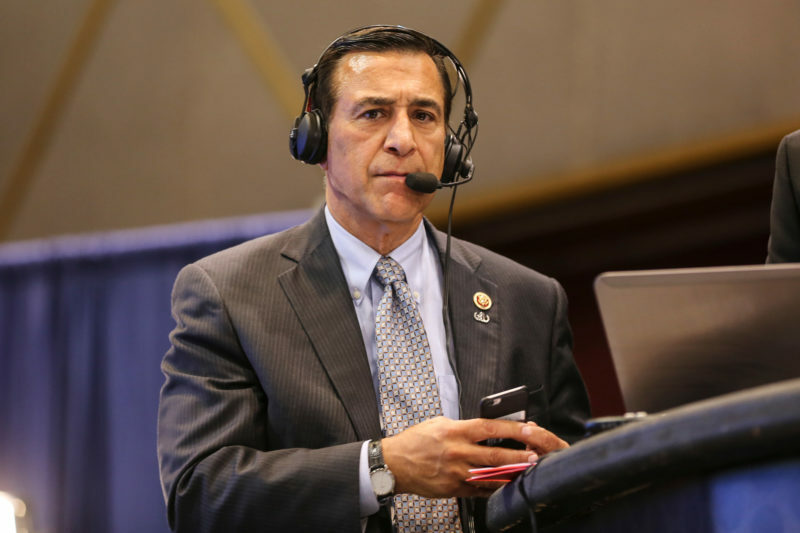 GOP strategists put some of the blame for Issa’s resignation on the Trump administration, but are confident the district will stay Republican. In fact, by removing himself from the picture and allowing someone else to compete, Issa may have done Republicans a favor in the long-term. At least that’s the message Republican operatives hoped would ring true. This is not how many of them wanted things to go, though. Coming on the heels of U.S. Rep. Ed Royce’s retirement announcement, Issa’s decision means that two vulnerable seats held by Republicans will now be up for grabs in the November elections when Democrats are expected to make gains around the country. With better planning, they could have had a couple special elections instead, giving Republicans a better shot. Jennifer Jacobs, a Republican political and media strategist, believes Assemblyman Rocky Chávez, a veteran and Latino with some credibility in the environmental movement, would compete well against Democrats if he can get past Republican leaders who are frustrated by his positions. He’d also bring a more San Diego, rather than Orange County, perspective to the seat. “This needs to stay a San Diego seat for San Diego’s sake — we can’t abdicate a congressional seat — that’s what is the most important thing,” she said. Chávez wasted no time in announcing his entry into the race on Wednesday afternoon. In a statement, he said, “It’s time we come together and focus on progress, not partisan politics and gridlock. We need to celebrate what unites us, not what divides us.” He cited, among other possible priorities, infrastructure and the military. Multiple Republican sources say Chávez has been preparing for months for the possibility that Issa would get an appointment in the Trump administration. That hasn’t happened. Jacobs said she was surprised the GOP did not manage presidential appointments for either Royce or Issa to provoke special elections. “They could have strategically done this better from a GOP standpoint and I’m not certain why they didn’t do it that way,” she said. California State Board of Equalization member Diane Harkey is also considered a leading contender, according to two Republican sources, and has already locked up key GOP endorsements, including one from House Majority Leader Kevin McCarthy. Her elections consultant is Dave Gilliard, who also worked with Issa and Royce. But Harkey has also been dogged in recent years by allegations that her ex-husband engaged in financial fraud. He was accused of engaging in a Ponzi-like scheme involving senior citizens and was ordered in 2013 by a court to pay back millions. John Franklin, Harkey’s fundraiser and senior advisor, told Breitbart that she’s assembled a campaign team with the backing of McCarthy. Democrats are investing heavily in California’s 49th District and see it as one of the most vulnerable in the country. Issa has been the subject of regular protests, and in the last election, he narrowly won. The top two finalists in the June election will move on to the November runoff. That could be two contenders from the same party. With so many candidates in the race, that’s not impossible to imagine. Jason Roe, a Republican kingmaker in San Diego, said he anticipates Issa’s announcement taking the wind out of liberal sails. One of the reasons the seat was competitive in 2016, he said, was because of Issa’s high-profile role atop the House Oversight and Government Reform Committee, and his investigations of then-President Barack Obama. “Whoever the Republican candidate is moving forward won’t have the same kind of visibility and won’t be as motivating to Democratic activists as Darrell was,” Roe said. Updated: Both Chávez and Harkey, through a surrogate, are reportedly in the race.